Discover the San Juan baths in Las Terrazas, Cuba. 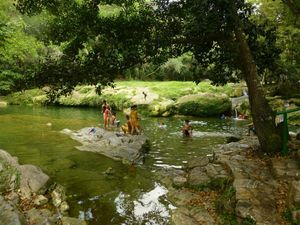 Baños de San Juan baths is one of the idyllic natural pools ready for bath in Cuba. This pool is located in the environmentally sustainable complex of Las Terrazas, in the region of Artemisa, three kilometres south of Hotel Moka. To reach the pool, you have to follow a winding yet asphalted road. The baths are surrounded by rocks forming marvellous natural terraces through which crystalline waters flow in a waterfall creating the pools. Near the river, you will find several picnic areas where to have lunch, including a sparse restaurant where fried chicken, rice, and salads; as well as changing rooms and showers; even some huts where it’s possible to stay for a night. Admission with lunch, 10CUC; without lunch, 4CUC.